Sephardic Jews, the Jews of the Iberian Peninsula, lived in Spain and Portugal for 15 centuries. Settling there during Roman times, they remained there during Islamic rule, developing a highly advanced culture. The philosopher Maimonides, still studied today, lived in Spain in the 13th Century. The Sephardim even developed their own language, Ladino, or Judaeo-Spanish, which is derived from Old Spanish and influenced by Hebrew and Aramaic. In 1492, the Spanish monarchs expelled Jews, and the Portugal followed soon after in 1496. After the expulsion, some stayed and became Conversos, Jews who converted to Catholicism. Others became Marranos, a term that literally translates to “pig,” and refers to the secret practice of Judaism under a veneer of Christianity. On April 13, Howard related a legend that, when the Sephardim left Iberia, they took with them the keys to their houses, because they deeply loved Spain and Portugal and hoped to come back. In the home of a Sephardic Jew, one might see a key hanging on wall. Flora Jagoda, a seminal figure in modern Sephardic music, composed the song “La llave espanya” (“The Spanish Key”) about this myth. After leaving the Iberian Peninsula, Sephardi Jews emigrated to North Africa, Southern and Southeastern Europe, the Levant, and even the Americas. Sephardic Jews built the first synagogue in the Americas, the Kahal Zur Israel Synagogue, in Brazil, around 1636. The Netherlands welcome Sephardi exiles; the philosopher Spinoza was of Portuguese-Sephardi ancestry. Trio Sefardi plays traditional and original music in Ladino that honors this tradition. While audiences will recognize their guitars, they play many older instruments not regularly used in contemporary music. The viola de gamba, or viol, played in the Renaissance and Baroque eras, resembles the cello but differs in several ways from members of the violin family: It has a flat rather a curved back, c holes rather f holes, sloped rather than rounded shoulders, and five to seven (in this case six) rather than four strings. It also has frets, and the bow is held underhand rather than overhand. Trio Sefardi described the pontic lyra, or kemenche, a three-stringed instrument, as sounding like a bad cough. Gathering at the monthly Carroll Cafe at Seekers’ Church in Takoma Park, Trio Sefardi’s concert began just after sundown on Saturday. Significantly, this marks the end of the Jewish Sabbath, which lasts from sundown Friday to sundown Saturday. To mark the occasion, they played Buena Semana (“a good week”), a traditional song that marks the end of the Sabbath and welcomes the new week. While the tradition of Sephardic music does not include songs originally written as instrumentals, Trio Sefardi chose to innovate by playing a medley of three songs that included (translated to) “This Mountain” and “Sorrowful Mothers.” “Sorrowful Mothers,” they explained, appears in the canon of numerous cultures and tells the tale of partisans giving up their lives for their country. The Trio explained that, ultimately, Sephardic music is more of a family music than a performance music. I found, however, that the performance was lovely and engaging, as well as educational. The music was beautiful and timeless, and it introduced me to folk songs and instruments I would never have known had I not attended this concert. Any music fan can benefit from hearing this ancient yet living tradition. For a Jewish music fan like myself, there’s a deep emotional connection to experiencing the beauty that my people have created, past and present. Ashkenazi Jews, the Jews of northern Europe, predominate in the United States, and many of us know shockingly little about the Sephardim. Their world is exotic and strange to us. I am deeply grateful for the opportunity to connect with an aspect of my heritage. 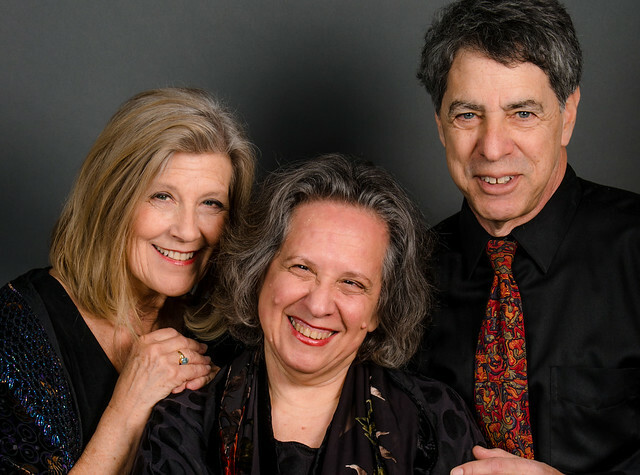 You too can be transported to another place with the beautiful music of Trio Sefardi by catching their next show at Jammin’ Java on Tuesday, June 11. Buy your tickets online. For more information on Carroll Cafe and to review a list of upcoming performances, visit the website of Carroll Cafe, located in Takoma Park, Maryland.